At Rutgers Future Scholars, we believe that access to higher education not only changes the lives of our students, but also has the power to change entire communities. 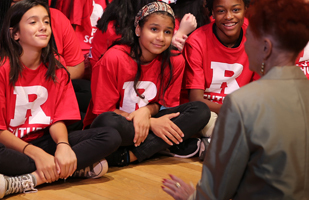 Each year, the Rutgers Future Scholars program offers 200 first-generation, low-income, academically promising middle school students from New Brunswick, Piscataway, Newark, Camden and Rahway the opportunity for a college education. Click on a town to learn more about each program. In the summer before their 8th grade year, students become part of a unique pre-college culture of university programming, events, support, and mentoring that will continue through their high school years, and eventually college. The Rutgers Future Scholars program does not replace high school. The program is additional to your standard high school classes, intended to prepare students for college by providing them with honors classes, cultural events, career skills, sports, and more. Future Scholars are expected to complete their regular schoolwork as well as the additional requirements of the Rutgers Future Scholars program. Students who successfully complete the five-year program will receive full tuition funding (through scholarships and federal grants) to Rutgers University. In short, Rutgers Future Scholars offers hope, opportunity, and tuition scholarship. • Increase the number of promising students who complete high school. • Encourage them to apply to and attend post secondary educational institutions, including Rutgers University. • Develop a replicable model to incite peer institutions in-state and nationwide. Rutgers Future Scholars participate in a series of active, focused workshops and events intended to foster each student’s academic, social, and personal development. Each year, participants build on their ability to confront and master new challenges, develop the skills needed to score competitively on college entrance exams, as well as explore career options. Scholars are required to attend mentoring, college readiness, enrichment, academic support, and team building seminars. During the summer months, students are also expected to enroll in rigorous enrichment courses for a minimum of three weeks (some six) to earn early college credit. Year one Career exploration and college orientation. Year two Critical analysis of non-fiction text, developing arguments, and cultivating the habits necessary for collegiate study. Year three Science, Technology, Engineering, and Mathematics (STEM), enrollment in credit-bearing courses, and SAT preparation. Year four Law, business, economics, and criminal justice, and continued test preparation. Year five Humanities, performing arts, and career interests, as well as college essays and applications. Each summer, Scholars are required to participate in programs on their local Rutgers campus. • It boosts a student’s academic skills. • It introduces them to careers and college majors in Science, Technology, Engineering and Mathematics (STEM), plus liberal and performing arts. • It also offers students the experience of living on a real-world college campus. These credit and non-credit courses and activities are intended to bridge the connection between the classroom and the real world, by integrating theme-based projects into the curriculum. The Program’s methodology and curriculum is multi-sensory, interdisciplinary, and holistic. We also partner with local business to help students familiarize themselves with potential employers. Most importantly, students learn what is expected in order to be successful in high school and accepted to college. Building a strong network of support is vital to each student’s overall academic success and future professional career. The Rutgers Future Scholars program connects students with a Future Scholars Mentor who provides them with mentoring, tutoring, and personal guidance. The Scholars receive tutoring as necessary to strengthen their academic achievement. Some students may need personal counseling with issues in the areas of family or personal stress or health concerns. The mentors assigned to the students connect them with Rutgers resources in the areas of social work or personal counseling as needed. The network of Future Scholars Mentors provides a strong foundation of support for each Scholar. This network may consist of an undergraduate student, a local professional, a community member, and a peer leader. Future Scholars from the same school district periodically take part in cohort meetings. This cohort bonding provides the chance for peers to interact and encourage each other. These meetings take place monthly in the school district, or on a Rutgers University local campus. • Develop a sense of kinship amongst the cohort class. • Disseminate important program information. • Provide academic and cultural enrichment support. When the school year begins, Scholars receive continuous support to assure success and motivation. We build on key points learned from the summer and provide unique events throughout the year. Scholars meet Rutgers University faculty and staff from over 100 major fields, as well as inspirational Rutgers undergraduates and Alumni. The Seminar Series takes place on a weekday evening (or a Saturday), approximately 5-7 times during the year. The Seminar Series concludes with a student-produced convocation open to parents, sponsors, and administrators. Future Scholars are exposed to a wide array of fine arts and performing arts at Rutgers. With its nationally recognized museums and art galleries, art facilities, notable actors, musicians, and Pulitzer Prize-winning authors, there are always wonderful events and extraordinary people to meet and experience. As part of our students overall development, the Rutgers Future Scholars program also hosts a number of cultural events throughout the year.